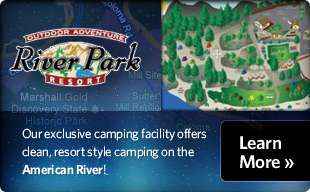 River Park Resort is your "family rafting center" for the best California family vacations with entertaining activities for kids of all ages. You can create your own California weekend or weekday getaway of "family fun" with us. Our 2 day trips on the South Fork of the American River are the perfect rafting adventures with camping and meals included. You can also raft for just a day on the South Fork and add other activities near the American River to your family vacation as you travel through California's Gold Country.. Your kids will rave about their California family rafting vacation with Beyond Limits Adventures! Activities just for kids...At River Park Resort, we offer rafting for kids as young as 7 years old. Conveniently located on the banks of the South Fork American River, our camp is the perfect launching point for your family rafting adventure! Make sure to leave time for other fun "off-river" activities including basketball, gold panning, viewing photos of the day’s adventure, sunbathing, fishing and delicious "kid friendly" meals. Our Monday/ Tuesday 2 day trips on the South Fork American River are designed especially for families. Our prices for these all-inclusive trips are affordable and our rafts will hold your whole family! If you have any young kids under 7 years of age you can split up the trip so one parent each day can raft while the other relaxes at camp with the kids! Our South Fork American trips can accommodate people of all ages and skill levels. Our trips are an excellent choice for families with small kids. The focus of our family trips is being together and sharing paddling teamwork and fun while bouncing through mild rapids. Older teenagers and adults may choose to paddle an inflatable kayak through the pleasant scenery of the South Fork's Lotus Section. Safety first... At Beyond Limits Adventures, we believe in safety first! Our experienced river guides are trained in the latest safety, rescue and first aid to ensure your family is safe and secure on their adventure vacation. Beyond Limits is a family-run business with over twenty five years of outdoor guiding experience on California's rivers. We have children of our own and understand water safety from a parent's perspective. Thousands of families have been safely guided downriver by our professionally trained whitewater guides. We use the finest adventure equipment and treat you as an extension of our family during your stay with us. Celebrate a family event ...for over 25 years, Beyond Limits Adventures and River Park Resort has been helping families and groups organize fun reunions, special occasion events, anniversaries, birthday trips and other annual outings. We have adventure trip planning tools just for group organizers to make your adventure planning as easy as 1-2-3! We can help you customize your experience to plan in exactly the types of activities and accommodations that meet your specific group’s needs. Find your Beyond Limits family adventure today!